Chris Crosby entertains in the historic city of Charleston, SC and beautiful surrounding areas. Chris is the creator of a unique and versatile sound that will compliment any special event. In addition to playing solo, with his duo or four-piece group, Chris has formed a trio with drummer, Anthony Constantine, and bass player Jamie Harris, to fit specific occasions. Playing as a trio adds flexibility for Chris to perform certain songs that need strong rhythms and further extends song selection options. The Chris Crosby Trio performs for corporate events, wedding ceremonies, rehearsal dinners, wedding receptions, cocktail and holiday parties, society events, and birthday/anniversary parties. 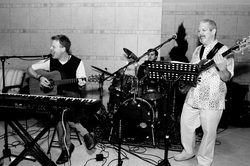 The Trio plays in ballrooms, living rooms, reserved restaurants, lawns, docks, and boats. Whatever the location or reason for celebrating, The Chris Crosby Trio commits fully and truly enjoys entertaining in a fun and tasteful way. Always volume conscious, the band watches the audience and works with event planners and clients to decide just the right time to kick in with high energy party music! The Trio’s versatility and professionalism has made them a favorite among wedding and event planning professionals. Chris Crosby, leader, Anthony Constantine, percussion and vocals and Jamie Harris, bass guitar, electric and acoustic guitars, and vocals.